Is Separating Families at US Border the Beginning of “Climate Apartheid”? There are moments that define a Presidency. This is one. There are moments that should haunt a politician for the rest of their career. And this should be one. The images these past few days of babies and kids being forcibly taken from their parents at the Mexican border are brutally painful to watch and have caused outrage the world over. Some kids are so young they cannot even talk. In a shocked and confused state, they have no idea where their parents are. Over 2,000 children have so far been ripped from their parents at the border in the last few weeks, and many fear they may never be reunited with their families. There are reports that kids have been forcibly drugged, and that a young mother “told her they would put her son up for adoption if she didn’t behave.” Two hours ago, the UN said what Trump was doing could amount to “torture”. Even seasoned journalists, used to reporting the insanity of war or the unimaginable horror of school gun-shootings, break down in tears live on air at the news of screaming babies being separated from their mothers. 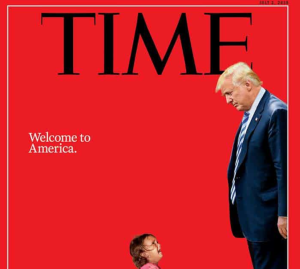 Time magazine (see image), whose front covers are meant to adorn many a Trump golf course, has an image of Trump staring down at a crying child. “Welcome to America”, says the magazine. This one will not adorn the walls of Trump Tower. Trump and Melania may not care, but the President was forced on Wednesday to sign an executive order reversing the child separation policy. However many pundits believe that this crisis is far from over. Crisis what crisis though? Today Trump tweeted that the whole fiasco was just being made up by the media and their “phoney stories”. There is nothing phoney about the facts, despite what Trump would like us to believe in his warped world. As many even struggle to comprehend the barbarity of the last few weeks, we forget about the future. But talk about the future, we must. Let us pause for thought (but not too long, as action is needed). Because as frightening as it might seem, the present might be bad, but tomorrow could be worse. And let’s start connecting what at first seem unconnected dots. We have a President who denies climate change. We have a President who is doing all he can to promote fossil fuels by opening up lands to exploitation to ripping up legislations and climate laws to stuffing position of power with fossil fuel lackeys who also want to undermine renewables. We also know that climate change is also creating refugees and will create millions, potentially hundreds of millions of refugees in the future. One estimate says 150 – 300 million by mid-century. So in short Trump is exacerbating climate change, which in turn is fuelling more climate refugees to leave their homes and seek sanctuary. And it is a climate crisis on Trump’s doorstep: By 2080, climate change could send as many as 6.7 million people to the United States from Mexico alone. Yes climate refugees from Mexico. The climate refugee crisis is actually closer to home than many people think. Yesterday the Daily Beast reported the headline that: “Climate Change Sparked the Border Migration Crisis”. “The agricultural crisis of the Northern Triangle area isn’t something that cropped up overnight, but has been in the making for more than a decade,” noted the Beast. As the dry corridor gets dryer, one of the many bitter ironies of climate change is, as Ecowatch rightly pointed out yesterday, that although “the impacts of climate change do not respect international borders … as climate refugees begin to flee deteriorating conditions”. Ecowatch adds: although “Climate causes have been lost in a media narrative about migration that focuses on families or unaccompanied minors”, but “The climate connection adds an extra barb to the cruelty of Trump’s hardline immigration policy”. More and more people are now making the connection of today’s horror, with what may happen in the future. On June 30th, you can join a #FamiliesBelongTogether action near you to demand the Trump Administration stop the war on our families and children. For more information go here.